1. Preheat the oven to 180°C, gas mark 4. Place the pumpkin seeds in a small roasting tray and roast for 6-8 minutes until golden. Set aside. Whisk together the tamarind paste, lime juice, maple syrup, oil and a good pinch of salt. Set aside. 2. Heat the quinoa according to pack instructions and divide between two plates. 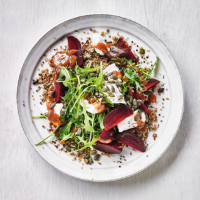 Top with the beetroot, rocket, goat’s cheese and toasted pumpkin seeds. Drizzle over the tamarind dressing and serve immediately. This recipe was first published in Tue Apr 09 09:23:58 BST 2019.